They Like Me, They Really Like Me! New Twitter Activity Feed Is Sticky and Sweet. Twitter today revealed the underbelly of its service, and it’s not dark — it’s happy and friendly! By displaying users’ favorited tweets more prominently as a feature of the new Activity tab — which is currently accessible to only a small percentage of users — Twitter exposes and encourages positive feedback. And there’s this weird thing about receiving positive feedback: It makes us feel good and want to participate more. Like the Google+ “+1” button and the Facebook “Like” button, the Twitter “Favorite” is a simple gesture that requires little effort or creativity. Before the Activity tab, Twitter favorites were sort of a personal bookmarking tool. Some users even made a habit of announcing “fav’d!” to those whose tweets they had favorited … using a whole ‘nother tweet. To that end, independent developer and blogger Jason Kottke built a service called Stellar that combines favorited items from Twitter, Flickr and YouTube. 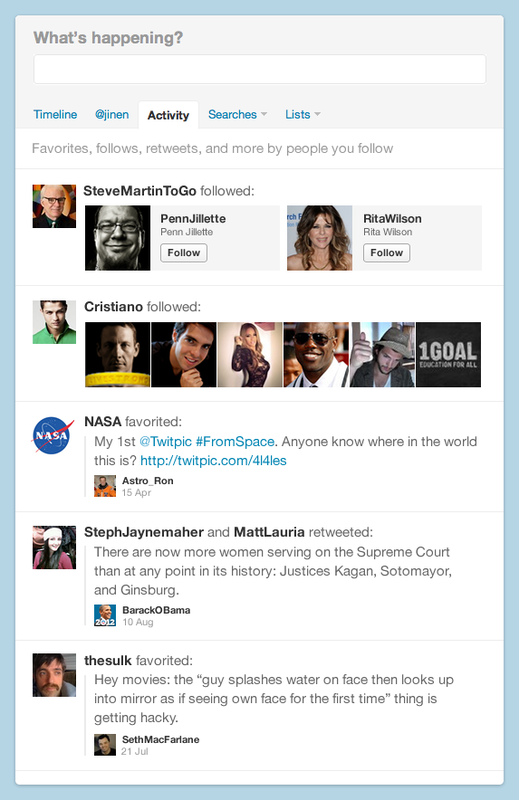 But now within the Twitter Activity tab, favoriting a tweet is an action unto itself, shown to other users. let the fav spamming begin!